What is it with DAB (digital) radios? They’re technically a step on from traditional radios, but nearly every one that hits the market has a seriously retro design. 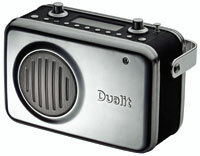 Not that we’re complaining when something is as attractive as this Dualit DAB radio. With a polished aluminium casing and softly rounded corners, it’ll match your Dualit toaster a treat. And as well as the looks, it does the business as a radio too. It has both DAB and FM coverage with presets of your favourites on both. A large LCD display on top gives you all the track information. As it’s Dualit, it’s designed to act as a kitchen radio, so also incorporates a cooking timer, along with snooze and alarm functions if you decide to use it in the bedroom. There’s also a rechargeable battery of you want to take your stylish new toy out and about. Available from mid-May, you should be able to pick this up at John Lewis, with a price tag around the £200 mark.